Is there an issue more globally urgent than creating truly inclusive societies? 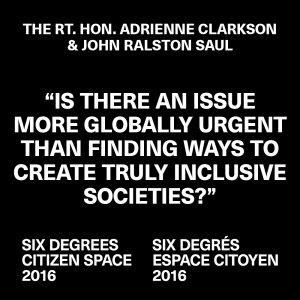 This question was dropped like a pebble into the lake of our collective consciousness at the tail end of the summer of 2016 as the 6 Degrees Citizen Space was revving up. The ensuing ripples came together in a “three day exploration of inclusion and citizenship in a world that demands answers now”. The list of people involved in the many discussions over these three days is the kind of embarrassment of riches and diversity of perspectives that I imagine event organizers think of when they daydream. It is easy to be seduced by the names on the marquee and the slick production values of the design materials, but at the end of the day, we were there because of this central tangled question. Is there an issue more globally urgent than creating truly inclusive societies? The uncontested answer is no. Given the social, environment and economic precipices that all of humanity is currently perched upon, truly inclusive societies are no longer the optional part of the meal. They are the entirety of the meal. How incredibly appropriate it was then that 6 Degrees created the opportunity for us to publicly have honest dinner time style conversations about something so personal as the need for inclusion. With little real distinction between speaker/presenter and listener/participant, we spend three days telling our stories, and sharing our aspirations and actions for societies where a sense of belonging is expected, designed for, and valued. We are all imperfect carbon based bundles of emotions, ideas and aspirations seeking a safe place to belong. This safety and belonging does not happen by accident, but must be relentlessly cultivated and encouraged such that all of us feel at home. Rabin Baldewsingh, the deputy mayor of the City of The Hague, described his own challenges reconciling his Dutch identity, or lack thereof, and it makes me pause and wonder. These challenges are linked to the fact that he is an immigrant, born in Suriname and of Indian descent. Despite being deputy mayor of one of the most recognizable Dutch cities, his sense of belonging does not come easily. At a global scale, human beings are essentially nomadic. Moving from one community, settlement, or town to another, continues to be part of the way we live our lives. According to United Nations data, as at 2015 there were 244 million people living in a country other than where they were born, 20 million of whom are refugees. The reasons we leave home obviously vary greatly, but for most people it is a giant leap with little certainty of what is on the other side. The same UN data above showed that the number of international migrants has grown faster than the world’s population. This brings us back to the fact that there is no more globally urgent issue than creating truly inclusive societies. These are societies that create and nurture their social, physical, economic and civic infrastructures with belonging as a key measure of success. The centripetal force of this kind of society has a twofold impact on our global family. It leads us to make decisions and take actions that reduce the reasons people are forced to migrate in the first place. Secondly, it creates the conditions for people who migrate, to more readily, and successfully, connect to their new community, and build a sense of belonging. Creating these societies will not be done by ‘the system’ or any other faceless institution or policy. What I took away from 6 Degrees was a reminder of the power of individual action, and our responsibility to use it for good, not evil. Our institutions, policies, laws and structures ought to be an extension of our shared image of the kind of community we want to create. The key is that the image must be a true composite of the spectrum of the best of our desires and noblest of intentions. All puns intended! We need not see empathy as a nice thing among friends, but rather as an actionable, tangible, community and nation building tool.